We install water drainage systems to keep the water away from your home’s foundation. 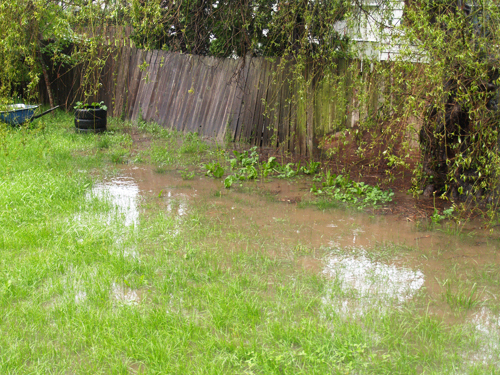 If you have water pooling in your yard or around your foundation, call us and we’ll take care of it fast. We install interior and exterior drain tile systems. We also install waterproofing membranes on the foundation walls. We install French Drains when to keep the water from pooling around your home. We install sump pumps to flush the water out of your basement and away from your home. 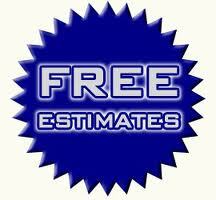 If you home is in need of a drainage system then call Best Waterproofing for a free analysis. 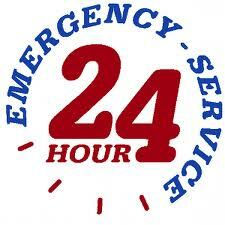 We proudly service Louisville, Southern Indiana, and surrounding counties. A French drain is a trench covered with gravel or rock or containing a perforated pipe that redirects surface and groundwater away from an area. A French drain can have perforated hollow pipes along the bottom to quickly vent water that seeps down through the upper gravel or rock. French drainage systems are common drainage systems, primarily used to prevent ground and surface water from penetrating or damaging building foundations. 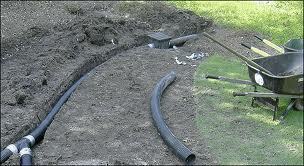 Alternatively, the French drain technique may be used to distribute water, such as a septic drain field at the outlet of a typical septic tank sewage treatment system. French drains are also used behind retaining walls to relieve ground water pressure. Depending on the expected level and volume of rain water or runoff, French drainage systems can be widened or also founded on 2 or 3 underground drain pipes. Multiple pipes also provide for redundancy, in case one pipe becomes overfilled or clogged by a rupture or defect in the piping. A pipe might become overfilled if it is on a side of the drain which receives a much larger volume of water, such as one pipe being closer to an uphill slope, or closer to a roofline that drips near the French drain. When a pipe becomes overfilled, water can seep, sideways, into a parallel pipe, as a form of load-balancing, so that neither pipe becomes slowed by air bubbles, as might happen in a full-pipe with no upper air space. In most homes, an external French drain or drain tile is installed around the foundation walls before the foundation soil is backfilled. It’s laid on the bottom of the excavated area, and a layer of stone is laid on top. In many cases, a filter fabric is then laid on top of the stone to keep fine sediments and particles from entering. Once the drain is installed, the area is backfilled and the system is left alone unless it clogs. While an external French drainage system can operate for ten years or more without the need for maintenance, it’s prone to clogging without any warning and can eventually lead to a flooded basement. When there is no filter fiber, sediments can make their way through the stone as years pass and clog the drain, and when the filter fabric is present, that can instead clog with sediments. It may be wise to provide cleanouts, much as is done with sanitary sewers, to provide access for inspection with a camera snake. Also, a French drain that is not installed with a sump pump counts on gravity alone to drain foundation water, and if the house is not located on a hill or near a steep incline, finding this slope can be problematic. Additionally, maintenance on an external French drain involves expensive exterior excavation, which includes removal of walkways, shrubberies, porches, gardens, and anything else along the perimeter. Interior French drainage systems are an effective way to waterproof a basement but requires the use of a sump pump. Many contractors will install plastic sump pumps that can quickly break down or neglect to install a battery backup sump pump, making the basement vulnerable to flooding during power outages. Sump pumps should be installed with a battery backup system in a proper sump liner of 20 US gal (76 L) size or larger to prevent the sump from having too little water and turning on and off continuously.